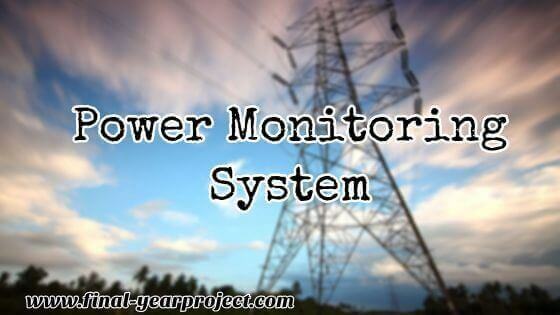 "Power Monitoring System" is a good project for Electronics and Electrical students for there project work. The microcontroller-based power monitoring system is an electronic device used to continuously monitor the parameters of power such as voltage, current, frequency, etc at the various points of electric or electronic devices. You can also Subscribe to FINAL YEAR PROJECT'S by Email for more such Projects and Seminar. The entire system is controlled by the microcontroller (80C31) and it is the real-time monitoring of various parameters. Thus the name "realtime monitoring of high capacity (400kva-600kva) battery backup system". This system is an 8-channel device, which accepts 8 analog input signals and consist of analog multiplexer, A/D converter, ROM, RAM, buffer etc. The different channels are selected by simple switch operation. From the UPS the channels and alarms are given to the microcontroller and it will process and control the parameters. The project on "power monitoring system" can be used for remote monitoring of electrical system and process plant. This power monitoring system has been constructed for heavy industrial locations, which is equipped with the latest technology to provide complete power analysis of power consumption, power disturbances, harmonics, and flickering in a single system. The block diagram consists of a power supply, multiplexer, A/D converter, microcontroller, EPROM, RAM, and display unit. The 80C31 microcontroller is the main component of the power monitoring system. The function of the microcontroller is that it processes the signal and controls the operation of the system using a fixed program that is stored in ROM and that does not change over the lifetime of the system. The microcontroller accepts the data, process it and display the output using a switchable display system.